It seems like it was just January 1st and here it is the last day of the month. It was a good month, a very good month. The DeCaDEnce art quilt show ended, and my piece The Flight of the Hummingbird is back home. The show curators authored a wonderful book about the exhibit and my copy is proudly displayed. They did a wonderful job with photography, editing and layout. Thank-you very much for all your hard work Pat, Julie, Val and Barb. I haven’t started work on any of the 3 goals I stated at the beginning of the month, but I did finish 4 big projects and have cleared my studio so work can now begin on them, along with another baby quilt. In fact there are 5 curved pieces cut out waiting to be assembled for the crazyquiltinternational 2010 challenge and the Bead Journal Project – which will be called BJP from now on. January started out cold and snowy, then we had an extended thaw, and now it’s back to cold and snowy. I faithfully exercised 3 times a week at physical therapy, everyday at home, and am starting to feel like me again. There is still aways to go, but I no longer need my handicap parking sticker. Yippee, yahoo!!! As promised, here are the pictures of the gorgeous face blocks I received from the crazyquiltinternational yahoo group Faces DYB. Nicki Lee’s reminds me of Cher, and Rose Anne’s brings to mind an Indian princess. Since I’m a big fan of Cher, I’m thrilled with Nicki Lee’s block, and I love what Rose Anne did with her block. 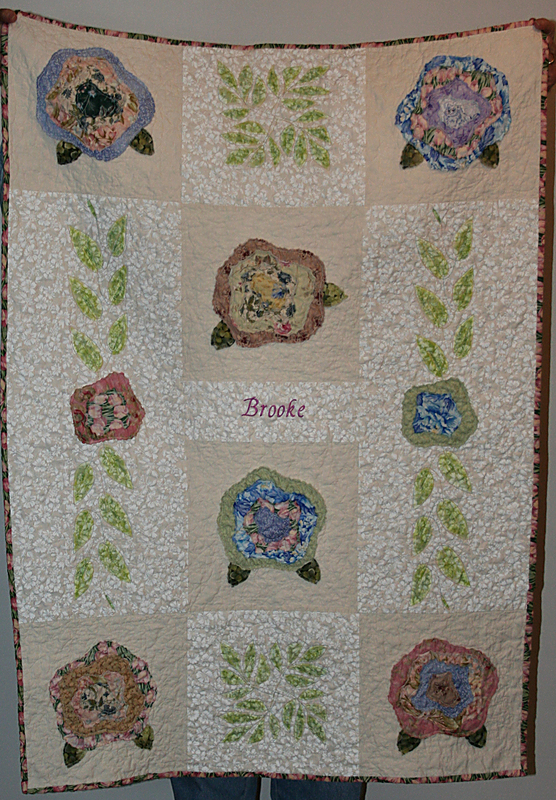 I’m not sure you can see when you enlarge the picture or not, but Rose Anne embroidered gorgeous feathers and appliqued them to the block. Her embroidery skills are really impressive, and I love that both the ladies worked with the same bead, but the faces have very different attitudes. Gerry’s face is so delicate and is perfect for a moon goddess. She even has a crown on her brow. I’m endlessly impressed by Gerry’s creativity. Debbie spent an amazing amount of time creating a gorgeous, and I do mean gorgeous, flowing mane of hair on her Lady of the North Wind. You can see the individual tendrils, and I am in awe of her embroidery ability. I don’t know what to say. She blew me away with these 2 blocks. The exotic Cleopatra face on the left wants to dance off the block, while the art nouveau style lady on the right is quite possibly the most beautiful interpretation of that style I’ve ever seen. The silk ribbon embroidery on this – oh my. Am I pleased with these blocks? What do you think? I’m ecstatic. They were going to be used for a wearable art jacket, but no way will I risk these gems on garment. Now I’m thinking I’d like to bind and frame each one of these faces and hang them as art work in my home. They deserve to be treated like fine art, because that is exactly what they are. Thank-you ladies. I can not express how much I treasured being part of this Faces DYB. Debbie asked for a Christmas theme and lots of toys. No one had used a nutcracker, and I do so love nutcrackers, so I printed a Dickens themed Christmas nutcracker for her on my new printer. The notebook that came with the blocks has a picture of Debbie dressed up as Mrs Santa in a Dicken themed Christmas gathering, so hopefully she’ll like a Dickens themed nutcracker. It didn’t look great on the square though. The center piece was a big piece of red fabric and the nutcracker’s jacket disappeared into the fabric. Out came my trusty box of doilies. Yes, I have a box, and it is a good sized box, full of doilies. 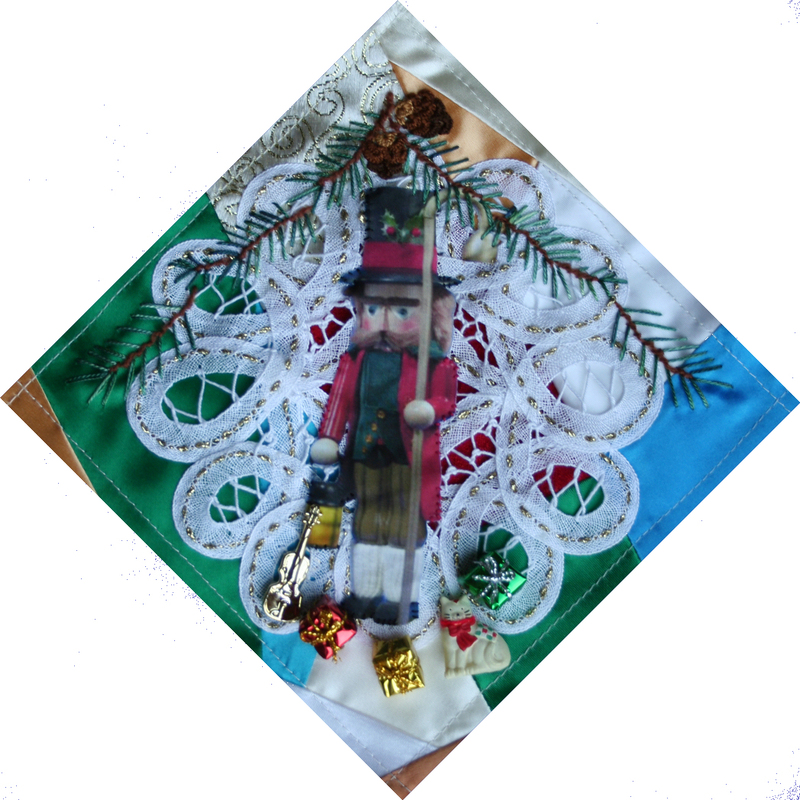 The nutcracker looked great against the doily, and doilies are a very Victorian type of thing to put on a crazy quilt block, so problem solved. I fused the nutcracker to the doily, so it can be easily removed if Debbie doesn’t like it. You never know. She might want more of the block fabric to show. There wasn’t any room for seam treatments, so this block is different from the others in the DYB. I wanted the block to have options, just in case she doesn’t like my choices. 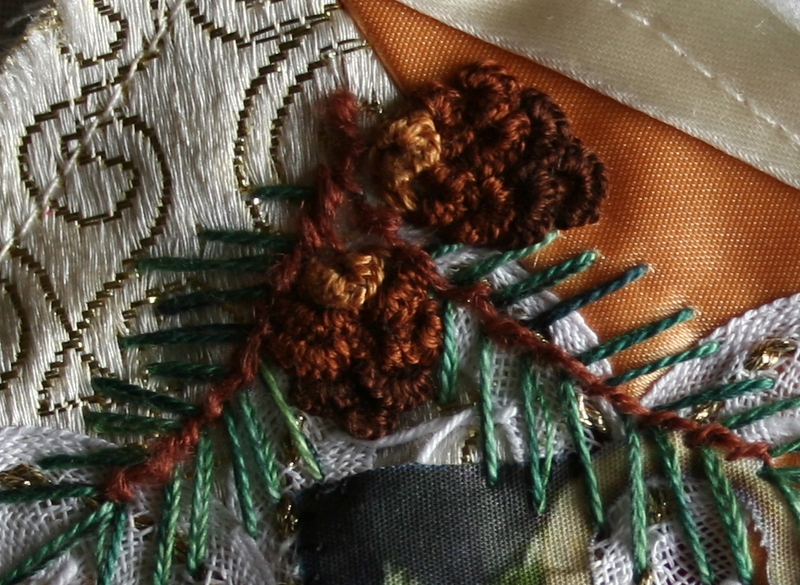 The nutcracker is also sewn down in lots of places to make sure it doesn’t separate from the doily. Next I went into every other doily hole with some gold cord I got from India. It really made the block festive. Next the doily was stitched to the block. Presents, a Christmas cat, and a violin were clustered around the nutcracker’s feet. Pine boughs and pinecones were embroidered along the top and 2 sides. I didn’t have the correct thread type so wrapped 3 strands of DMC floss to get the thickness I needed for the cast on buttonhole stitch pinecones. This stitch is much easier to do with 1 strand of pearl cotton thread. The threads would separate, then they’d fall off the needle, then the needle poked into my finger, yada, yada, yada. You get the picture. It was definitely a challenge, but the block didn’t get a speck of blood on it. The pine needles were embroidered twice. Once with a 12 wt variegated Sulky cotton thread and once with some of my hand dyed pearl cotton thread. I hope Debbie will like the block I made for her. I certainly enjoyed being part of the Faces DYB exchange and will share the pictures of what everyone made for me later this week. Can you believe it? This is what my front yard looks like on January 25th !!! It’s a miracle. 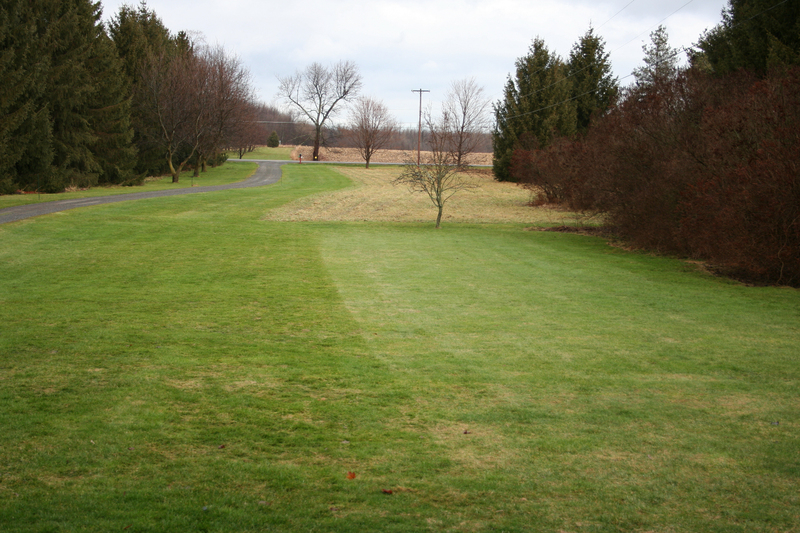 I live in Upstate New York, and it’s quite amazing to see green grass at this time of the year. It’ll be covered with snow by tomorrow, but it sure is nice seeing that green today. 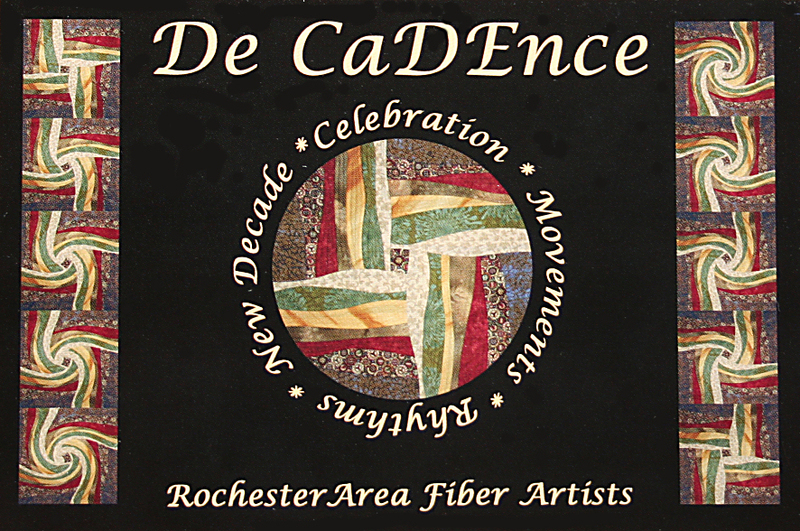 Today I visited the Arts & Cultural Council of Rochester to view DeCaDEnce an art quilt show presented by the Rochester Area Fiber Artists. One of my pieces is hanging in the show and I missed the opening reception, but did get to enjoy seeing the show. Everyone did outstanding work and all the pieces were displayed beautifully. The exhibit dates are January 5-28, 2010, so if anyone is in the Rochester, NY area, please drop in, enjoy the show, and be sure to sign the guest book. It’s been a busy couple of weeks here. First, I saw Avatar and absolutely loved that movie. I do not understand why some reviewers say it’s heavy handed about the environment and anti-American. Most of us are trying to recycle, not waste energy and do as little damage as possible to our ecosystem. Hurrah for the movie promoting that idea. As for the enemy in this movie? It is a nameless corporation who has invaded a new world and hired ex-military to forcibly move the indigenous society because they want the metal under their home. Now come on. Big business doesn’t give a rat’s *ss about anybody but their profits. It was real easy to embrace disliking the invading force. I was mesmorized by the sheer beauty of this film, and came away inspired by the colors, and the special effects. The pleated spiral flowers that closed when touched reminded me so much of Fortuny pleats. What can I say? I relate everything I see to textiles. And since I’ve been exercising regularly, when Neytiri jumped on her banshee and launched into the sky, I almost cried. It was a breathtaking melding of her muscles and mind with the flying banshee. What can I say? I enter into movies heart and soul. I give it 2 thumbs up and wish I had more thumbs to raise for this terrific movie. 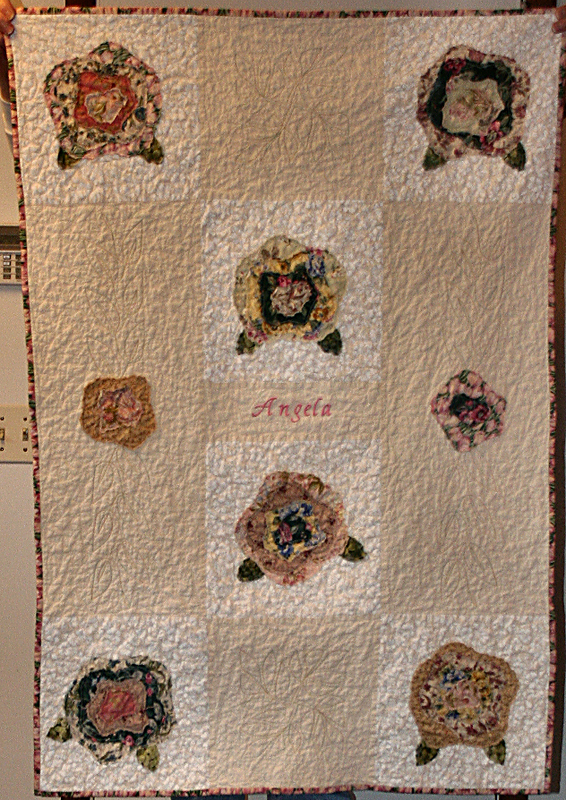 The second one is similar with the name in a different rayon thread color and the roses a warmer palette. Brooke is a blonde (cooler based colored quilt) and Angela is a brunette, so she’ll receive the warmer color palette quilt. If you click on the photo it will enlarge for you, and you might be able to see the cat in the middle of that rose. I did a lot of fancy quilting on this and it didn’t show at all, so out came my paints. 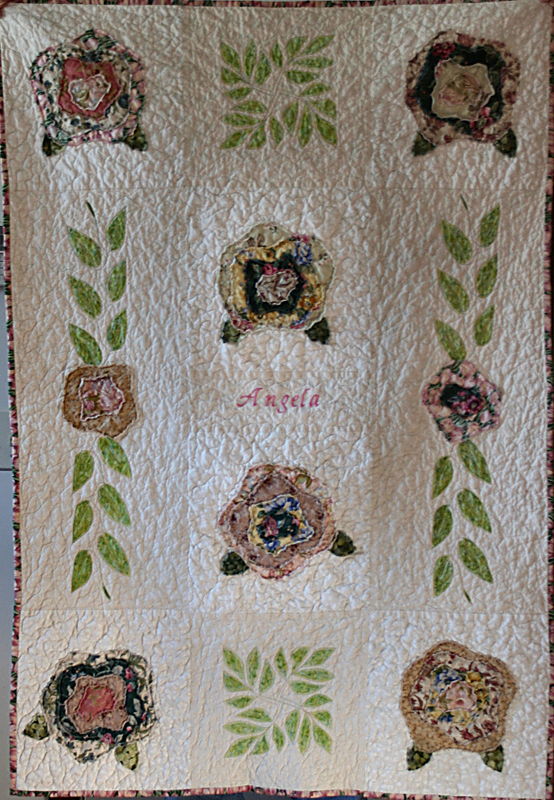 The leaves were quilted with variegated Sulky 12wt cotton thread. I adore this thread. It is a heavier thread and outlines a quilted design beautifully and stitches well on my sewing machine with a top stitch needle. It’s also great for tatting. But back to the paints. The first layer was a mixture of 3 different Dyna-Flo paints and one Golden paint. It dried and was a bit too light, so I mixed 2 other different colors and used a lot of extender to create a light color wash. It came out exactly how I wanted. This is not a very controlled way of comparing yesterday’s photo with todays though. First – because the light was different on the 2 days the photos were taken. Second – even though I used the same adjustments to both photos in Paint Shop Pro, I’m not sure I used the same claifying strength. That will remind me to write everything down from now on. Third – the old fabric print has been air cured for almost 3 months. The newly printed piece had only been air cured for 1 day. After those disclaimers, I have to say I’m pleased with the results. 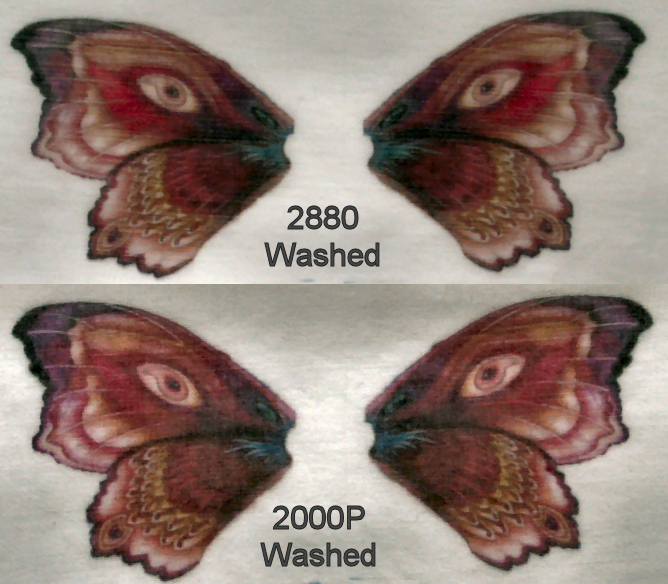 The images are still both very nice, and now I know the fabric I print with my new Epson 2880 can be washed without losing a lot of color. These small pieces were hand washed as I was afraid they’d fray too much in the washing machine. I used Kirk’s Castile soap and used the same motions I’d use if I was soaping up a washcloth. They were dried on a white towel so I could see any ink runoff, and the towel stayed nice and white. Good golly, who knew I had so many people inside this one body. Stay tuned. Who knows? A few more might emerge any moment. Yes, my new printer does a nice job printing on fabric. The new printer image is the one with 2880 on it. I couldn’t believe most of the fabric I had printed with my old printer is no longer in my possession. That’s a good thing because the art work has sold, and I was lucky to still have this in the house. The only thing I’d like to fix, is that little bit of a black line that appears between the 2 wings. I purposely put the numbers close to them so they could be easily spotted. Has anybody got any tips on how to avoid that from happening? If you double click on the image it will enlarge so you can spot the black lines better. It happened with my old printer too, so it might be the way I’m attaching the fabric to the cardstock. The ink didn’t smudge at all, and I poked at it with my finger less than a minute after it came out of the printer. I’ll wash the 2 pieces next, and then do another comparison photo. They probably won’t get washed till next week though. We’re having a party here, and I’ll be in full fledged cleaning/cooking mode for the rest of the weekend. This is a banner day for me – the first day of 2010 and my 100th blog post. It seems like I just started blogging, but here I am at the 100th mark. 2009 was a lousy year for me healthwise, but that is behind me now, and I’m looking forward to accomplishing a lot this year. There is nothing quite like opening a new calendar and looking at January 1st of a new year. Optimism overflows and it seems like anything can be accomplished. Last January, I mentioned how I was trying to reorganize and declutter my home and studio rooms. I had been steadily working towards “lightening the load” since a dear friend moved out of town and was faced with packing a lifetime of accumulating this, that, and anything that appealed to her. I’m pleased to say another 441 pounds was moved out in 2009. That brings my grand total up to 2,354 pounds. Now that sounds like a huge accomplishment, and I do celebrate it, but it’s a drop in the bucket compared to what still has to be sorted, donated, or tossed. That is a scary thought, isn’t it? This slow and steady approach works for me though. It’s not stressful, I’m going in the right direction, and with any luck, I’ll be finished in another 4-5 years or so. 2010 is the year where I will commit to 3 big creative projects. The first is participating in Robin Atkins’ Bead Journal project. It’s my first time joining this group. As I’m pretty much well a beginning beader, this should help me improve my beading skills this year. The second is committing to the Crazy Quilt International Yahoo group’s 2010 Challenge. There are no hard and fast rules in this challenge except for trying to complete each monthly technique throughout the year. January is pieced curving, February is working with velvet, etc… You get the idea. Each month has a different skill to learn, and by the end of the year, all will be represented on one block/quilt/purse/garment, etc. The third, and most likely the hardest for me, will be working towards my goal in the Visioning Project I joined as a member of Studio Art Quilt Associates. It is a public committment of the artist to achieve a specific goal. So far, I’ve been reticent to state my goal, but it’s time to quit dilly-dallying around and admit I’d love to have an article published in Quilting Arts magazine. Now that I’ve said it here, I’ll have to fill out my Visioning page in the group and start working towards accomplishing it. All prayers, well wishes, good karma sent my way would be appreciated towards attaining that goal. Best wishes for a Happy and Healthy New Year to everyone.